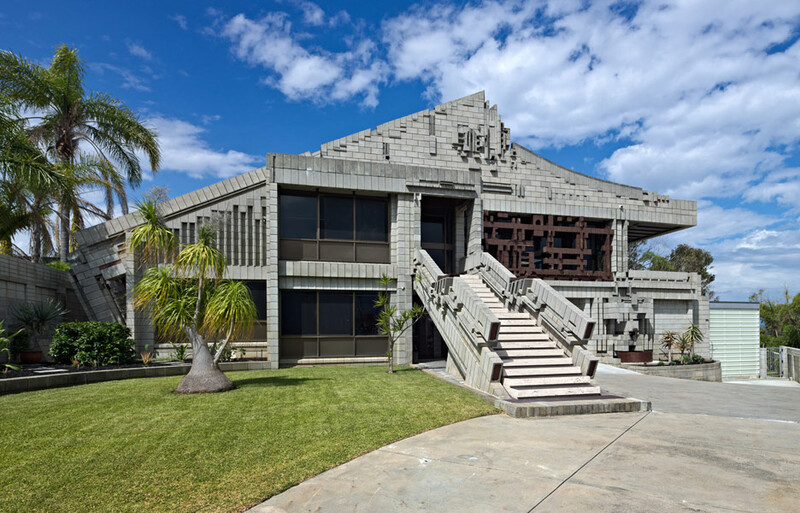 The Marsala family residence is an iconic Western Australian house, a towering sculptural ‘lookout’ designed and constructed by Bulgarian-born architect Iwan Iwanoff for Tina and Sergio Marsala. Today, it is widely known among the Iwanoff owners’ fraternity and keenly discussed by local architects. 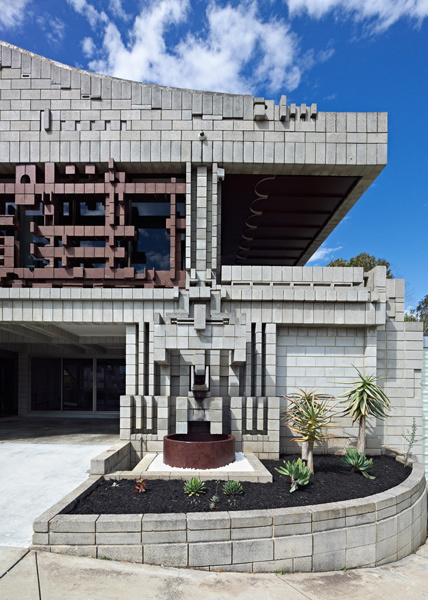 Recently, owners Mark Etherton and Chris Beer engaged Donaldson and Warn Architects to oversee refurbishment of this residential classic, making a significant contribution to local architectural culture: the Marsala House was the recipient of the 2011 WA Heritage award for ‘outstanding conservation of a heritage project’. Although the plan’s configuration is somewhat rational, with a central living block extended using a centrifugal service wing, typical of Iwanoff, the entire spatial sequence and material palette is intense. Tectonic and spatial animation is a hallmark of his late work, and perhaps finds its most flamboyant expression here, although the extravagance evident throughout the house also reflects the ambition of the clients. Sergio was a builder and together with wife Tina wanted to create a design statement. 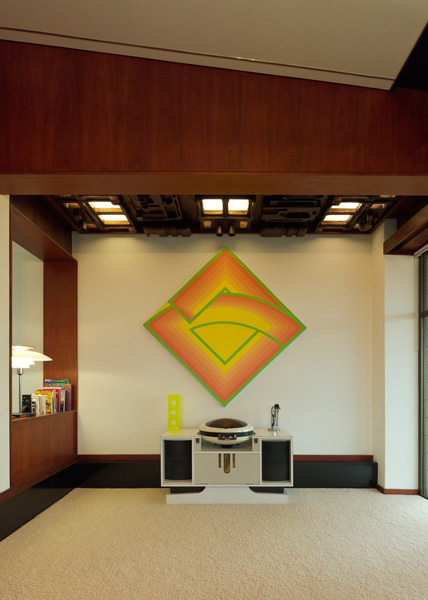 They commissioned Iwanoff, well known for creating significant domestic architecture, and journeyed extensively, selecting furniture and artworks from international and local sources for their nirvana. Different versions were created between 1973 and 1975 before Iwanoff delivered his masterwork in 1976, and consistent with his attention to detail, elevations show each block drawn and numbered. There’s an extensive archive of these beautiful drawings accessible at the J.S. Battye Library of Western Australia. Marsala holds a commanding position at the top of the hill. It’s sited at the culmination of a cul-de-sac and adjacent to a park of remnant vegetation, a powerful settlement approached from below, ending a winding procession through the suburban streets of Dianella Heights. Three concrete block obelisks mark arrival, signalling entry into a new kind of spatially integrated environment, a place where the usual codes are exaggerated, condensed and masterfully combined to form a captivating domestic setting. The unusually long driveway leads to an expressive gable-ended facade, a highly mannered interpretation of classical language. It’s not dissimilar to the compositional order of the Vanna Venturi house in Philadelphia and its broken gable roof, centralised entry and asymmetrical fenestration. 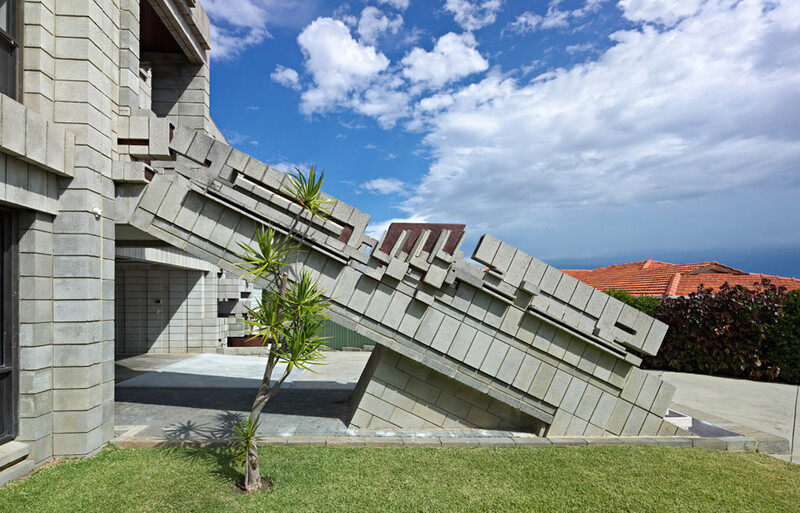 What establishes this house as utterly unique, though, is the tectonic vibrancy of the concrete block, the expressed channelling of rainwater and the overstated central stairway, which combine to establish a powerful plastic force. Proceeding via the grand stairway, the entry foyer terminates a northerly axial momentum with an ornate jarrah modesty screen, directing attention southeast towards sweeping views of the city and Darling Escarpment. Immediately, the highly crafted finish and complex spatial order of the house is evident, and a rich collage forms from built-in furniture, multiple surface textures, sequenced rooms and choreographed views. 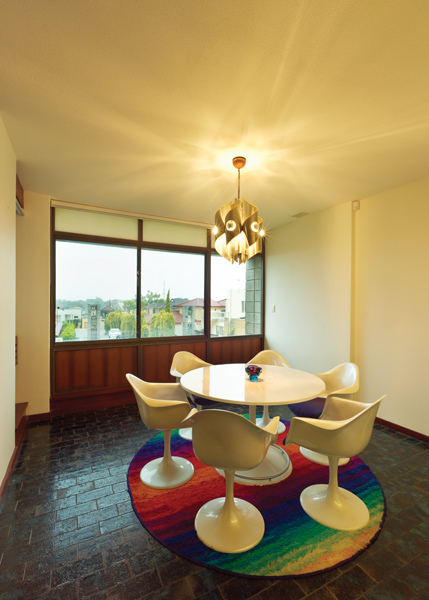 The central kitchen and dining room is furnished with circular dining table and domed ceiling, establishing the gravitas for the entire home. It’s reminiscent of Sir John Soane’s home at Lincoln’s Inn Fields, with its richly decorated surfaces, extraordinary collection of fragments and ingenious arrangement of rooms. Like Soane’s famous ‘Breakfast Room’, Marsala’s dining room structures views and spatial sequences through the house. To the north, past the ornate, bubble- mirrored, purple-and-white Laminex bar, a courtyard pool garden is glimpsed. Then, shifting slightly left, blackened timber panelling leads down half a flight of bronzed-mosaic tile stairs to the western service spine, accentuated via a raised vermiculite ceiling. 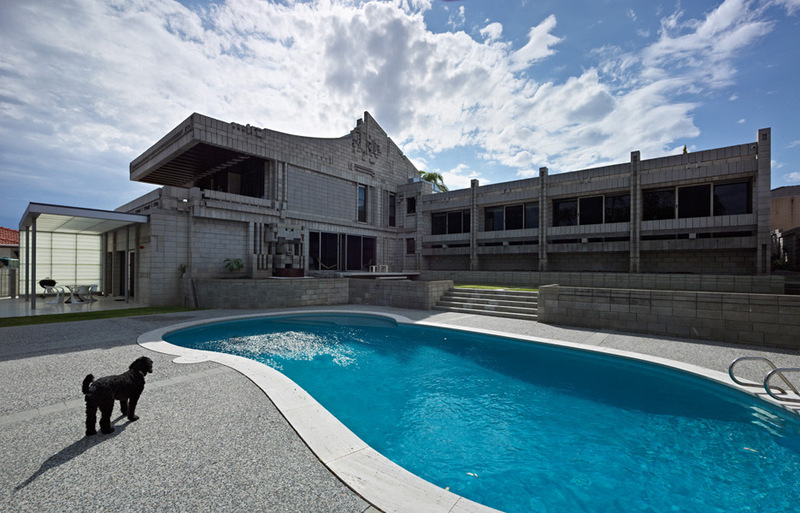 Next: a sunken games room (originally a snooker room); roof-lit service rooms with purple Laminex ceilings; and north-facing bedrooms, each with a balcony overlooking the pool courtyard to the remnant bushland beyond. Carefully located perimeter windows open to extraordinary moments, including a series of astonishing gothic buttresses. Returning to the central dining room, attention is again directed across adjunct rooms, which contain the original ‘tulip chairs’ with their refurbished, purple-knoll wool seating. Through window openings protected by ornate concrete sunscreens, there’s a view back to the front garden and long driveway from where our journey began. To the east, through a timber screen, marble steps lead to a sunken lounge with ornate, white-gloss ceiling and hyperbolic black cornice. Thick openings reveal a deep balcony and blackened timber ceiling, creating a ‘shadow room’ for full enjoyment of Perth’s extensive city vistas. The balcony would seem the ultimate surprise, yet there’s more to come: beneath the balcony is a fully decked-out disco room, direct from Las Vegas. 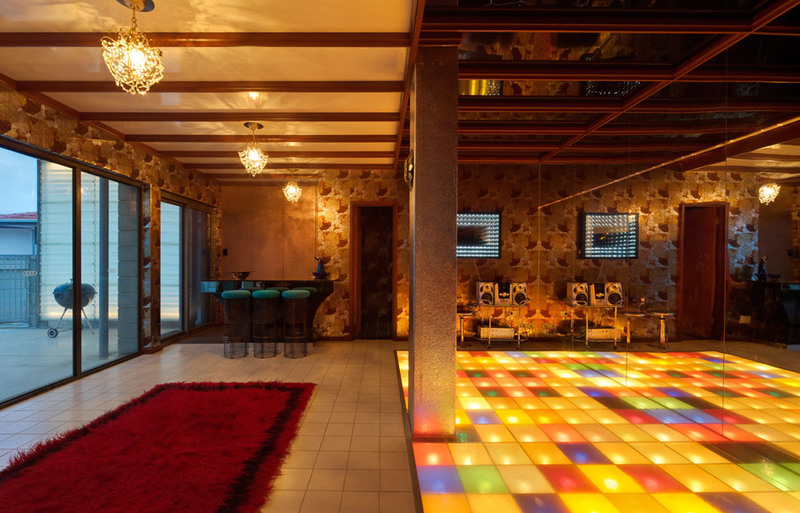 Sergio and Tina visited Vegas during the late 1970s and on their return asked Iwanoff to add a new room: a fully functioning, Perspex-floored, mirror-lined room, with synchronised coloured flashing lights and equipped bar. This is West Coast architecture at its very best! Finally, a story – one that articulates the nature of both architect and client. During construction, Sergio said to Iwan that costs were increasing and, because he did not have bottomless pockets, he would have to propose drastic cutbacks. Iwan turned to Sergio and said, ‘Such cutbacks would be like cutting off my arm.’ Of course, the house was completed as intended, Iwanoff kept his arm and Sergio built his dream. 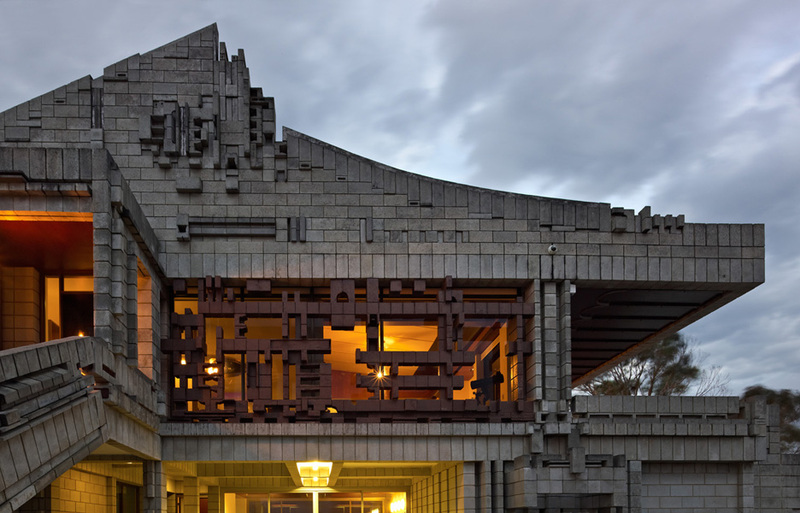 Together, they created significant architecture that will resonate forever, their imaginative efforts bound into form, function, spatial order and materiality – a dense tectonic language.